This trek passes through many villages of west Nepal. Despite having been not far from capital Kathmandu, it’s really deprived and backward in terms of developments. Our project sites include this region as well. From teaching in school, working as health assistant to contributing in water supply program are the options that you can participate in. Day 02: City tour in Kathmandu valley which includes the visits to many historical and architectural monuments. Day 03: Drive from Kathmandu to Dumre by tourist bus and from Dumre to Bandipur by private jeep. Visit the typical Newari village and overnight at camp. Day 04: Trek gradual down hill from Bandipur to Sukhauraphant through village settlements, paddy fields and some light fixed forest, approx 2 and half hours. Continue trek passing gorges, jungle and fields to Mastighat pul (bridge). Explore around, Overnight at tented camp. Day 05: The trail from here heads ahead with gradual ascent crossing gorges, streams and passing through jungle and village settlements. After approx one and half hour, the trail climbs uphill and goes along the ridge of hill and reaches the top of Dubung village which takes about 3 hours. This is Min Thapa’s village which is really rich in its own culture & tradition and gifted by nature. Overnight at tented camp at Bhalethunge Danda. Visit the historic Royal throne of the Thapa king of an ancient time when Nepal was divided into many different kingdoms. 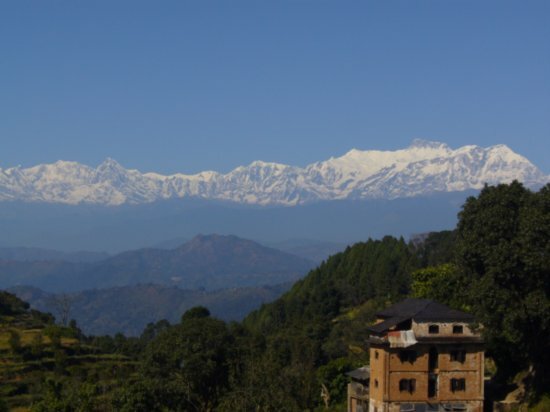 The views of the beautiful Himalayan ranges and nearby hilly areas seen from here are simply spectacular. Day 06: Day at Dubung. Morning Hike to Sasarki Thumka from where views of Tarai and also the stunning views of Annapurna, Dhaulagiri, Manaslu, Gorkha and others Himalayan ranges can be enjoyed. Exploration around Dubung village. See the lifestyle, culture, tradition etc. In the evening, enjoy the typical Magar cultural dance; Kaura, Maruni etc. Overnight at tented camp at Bhalethunge danda. Day 07: One more day in Dubung. Explore more of what this beautiful village has to offer, overnight at tented camp at Bhalethunge danda. Day 09: Today the trek starts with the walk along the ridge of the hills until we reach the village Khudi. After Khudi village, the trail goes downhill towards Damauli. We will cross the Seti River and camp on the bank of the River which is also the meeting point of the Seti and Madi Rivers. The famous cave Byas will also be nearby us. Overnight at camp. Note: You can also shorten or extend your program if you wish. Land transportation from Kathmandu to Sundarijal, Bimat to Gorkha and Gorkha to Kathmandu by private car/van.